Nintendo today released version 2.0 of Super Mario Run, its popular Mario-themed platform game for iOS devices. Today's update adds a host of new features, including new playable characters, an easy mode, additional free content, and more. 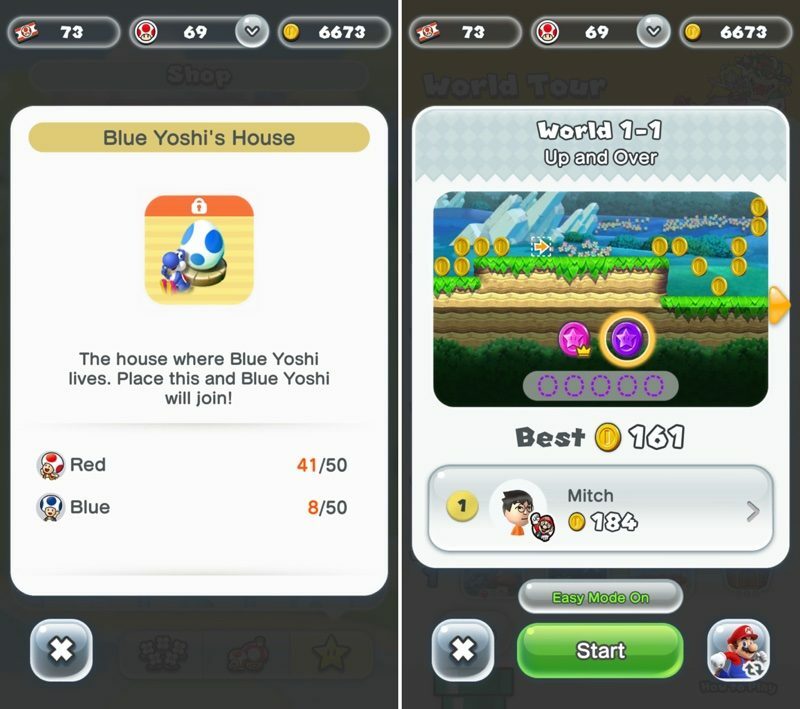 Starting today, players can get different colored Yoshis in Super Mario Run. Using a Yoshi of a particular color to play Toad Rally will result in more Toads of that color when a rally is won. For customers who have not purchased the full Super Mario Run game, Nintendo is adding more free content, in the form of Bowser's Challenges. Completing one of Bowser's challenges will unlock the previous locked 1-4 course. Clearing 1-4 will then unlock new courses to play in Toad Rally, new Toad colors, and new Shop buildings. For tough challenges and for players who aren't as skilled, an Easy Mode has been added to the game that can be selected when using World Tour mode. This will make the basic Mario levels easier to complete. Nintendo has also made adjustments to the tutorial to make it easier to understand special actions, pink coins, and more, and there have also been tweaks to the number of Rally Tickets received from the ? Block and it's now easier to get some of the buildings in the shop. For Toad Rally, the appearance rates of various Toads have been adjusted, making it easier to get Toads to purchase buildings. In the future, Nintendo also plans to add additional buildings that will be unlocked by an event. One thing they should really do is an offline mode. Will never download or purchase this game unless offline mode becomes reality. I know a four-year-old who completed this game. I don't think an "easy mode" is needed. Doubtful. Some of those black coins are downright devious and the black pipe stage is nasty. This, on the other hand, would be a genuinely useful "feature" (feature in quotes because it's not a feature at all but just something one expects from a side-scrolling game). That being said, it is a fun a game. Yeah, I don't get how anyone can find it all that difficult. It's nice that there's a little learning curve - not so much that it'd be frustrating but enough to make it seem more meaningful when you mastered something - but it really doesn't take all that much skill or time commitment to get reasonably good at the game. It sounds like whether or not it can be beaten fairly easily, having a mode where you have to worry about even less and just sort of have continuous play for fun and just to fool around or something like that isn't exactly a bad idea.